The following is a simple guide for exercisies you should perform after your surgery. It is very important to do these gently only go to the limit of your pain and not beyond. Following shoulder surgery you will be seen my physiotherapist prior to discharge. Your exercise programme will include the below exercises and others depending upon your operation. Each exercise should be done three times a day. You should do five of each exercise but decrease this if it is making your shoulder too sore. Take your arm out of the sling. Bend and straighten you elbow. Then move your wrist around to make a circle. Spread your fingers out then make a fist. 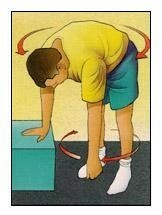 Gently bend your neck forward, backwards and side to side. Take your arm out of the sling and let it hang down with your elbow straight. 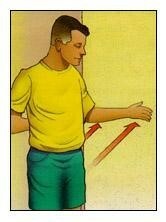 Bend slightly forward and move your arm around gently in a small circle. This is illustrated in figure 1. Take your arm out of the sling and rotate your arm to outwards with your elbow tucked into your side and your forearm parallel to the floor. Stop when your hand is straight out in front of you. This is illustrated in figure 2. For a PDF download of these exercises, see here.